Erndales N More: A Lot from a Little! I can't believe another weekend has come and gone so quickly. I won't even comment on the weather, as it is just too frustrating already, but I will say it wasn't the best for any outdoor activities. So it was another weekend of working indoors. I managed to finish a couple of small projects and I would have finished much more, but somewhere along the weekend I decided to change things up in my "studio" again. I have 2 pianos - one a 85 yr old upright which sits in my living room, but which also has some issues that make it unplayable at the moment. I love this old gal the best, when it is in tune, it has a rich mellow sound that heals everything within me. The other piano is an electric piano - which is downstairs with the pipe organ. This piano is rarely played because of it's location. It interferes with my husband's TV time, and his time practicing time on the organ, so unless we are playing music together it sits idle. This weekend I sat down at the old gal and played for over an hour, but gave up when everything sounded sour, then I went downstairs and played for an hour on the other piano and decided quite suddenly that I should bring it upstairs so I could play it without interrupting anyone else. Where to put it? The living room is full, the dining room - no - too small. 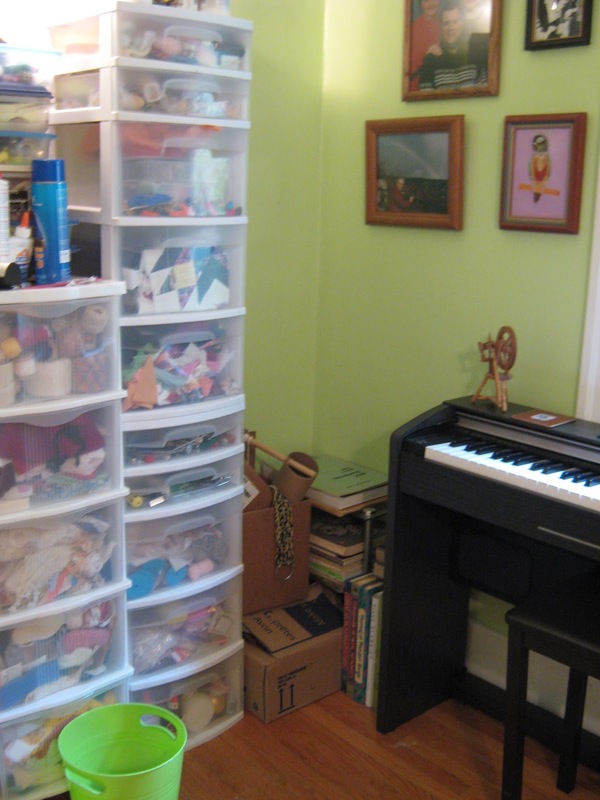 I know - the "studio" - Surely I could squeeze one more object in a room that is already scary crowded!! I conned my son and hubby to struggle the piano up the back staircase, and amid much muttering and complaint about my passion for moving furniture around the house, the deed was done. I lost some work space (my son's drafting table) but I was loosing that soon anyway, as he wants it back in his room. So now if I want to play - I can anytime... or I can craft, or sew, or sit on the computer. Talk about getting the most from a room! 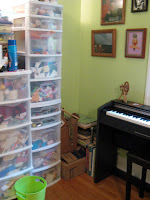 See it's still a craft room... LOL!